April’s MiniMoFo theme is “in season”, and it’s Easter this month, so what could be more seasonal than chocolate?! 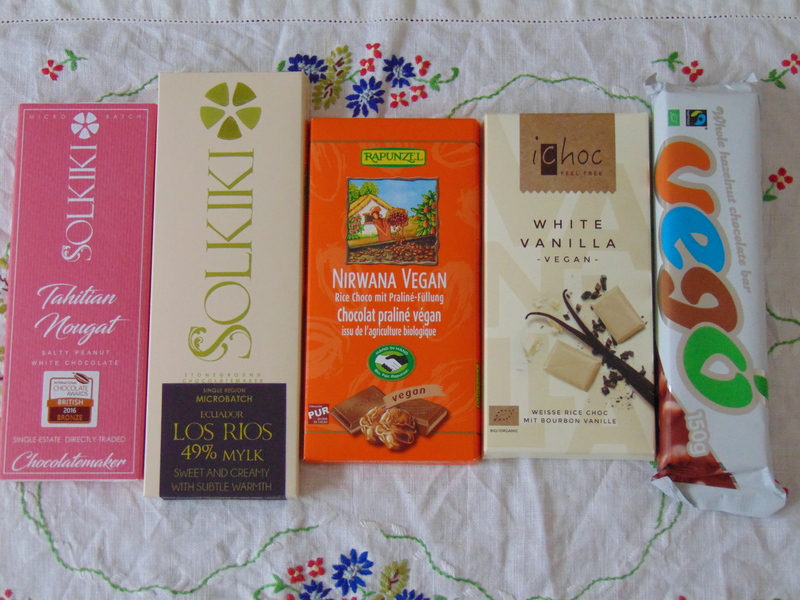 It was my birthday at the beginning of April and I got a surprising amount of chocolate. And happily, it’s all on the approved list of the Food Empowerment Project. If this project is new to you, please take a few minutes to read up on it. The approved list is a great guide to which chocolate companies are completely cruelty free: that is to say, neither animal cruelty nor human slave labour involved. These are the companies I am happy to give my money to. 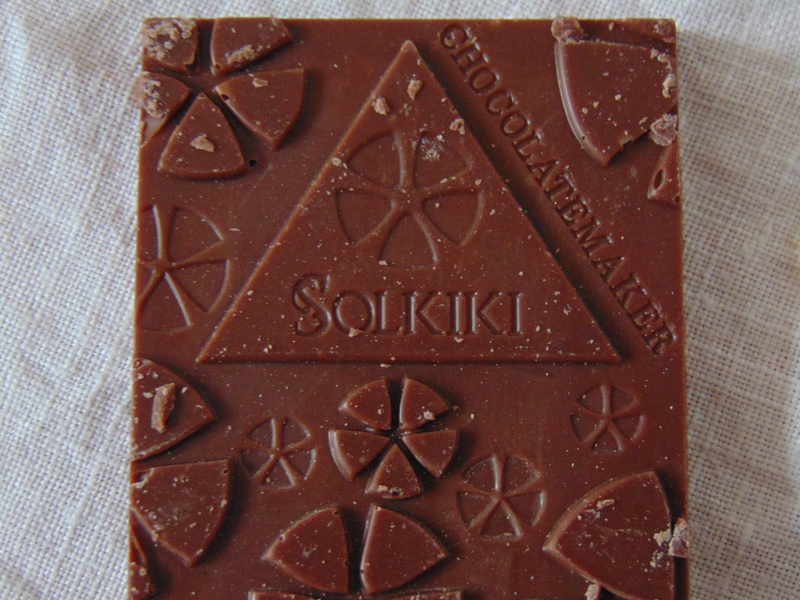 I discovered Solkiki at the VON Christmas Fair in Manchester last year, and I was counting down until I could ask for some more bars as a birthday treat – they’re not cheap, but they’re mega delicious. At the fair we tried a few samples of dark and white chocolate, and bought a couple of each, but there was no milk chocolate for sampling, which means I was extra keen to get my hands on some this time around. It was worth the wait – so creamy and delicious! It’s definitely one of the best milk chocolates I’ve had, and I’m already trying to justify the cost of another order. 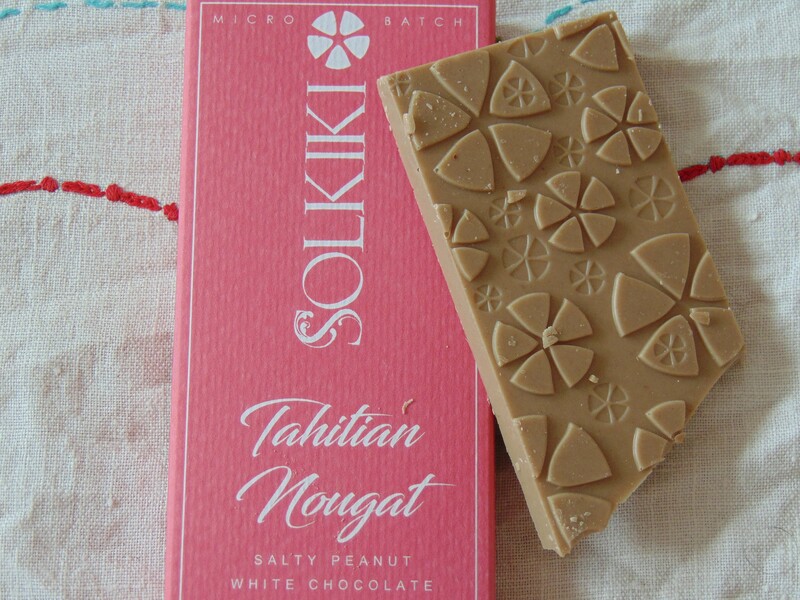 The other bar I got was the Tahitian Nougat, which I also had at Christmas. It’s salty, nutty and just incredible. The man who was selling the bars at the Christmas fair said confidently that this is not the kind of chocolate you can eat in one sitting, but I strongly disagree – Dr HH and I make pretty short work of these! It’s so creamy that it doesn’t really resemble white chocolate, which is no bad thing in my opinion. I’ve never seen this chocolate in the UK, so I was happy to try something new. 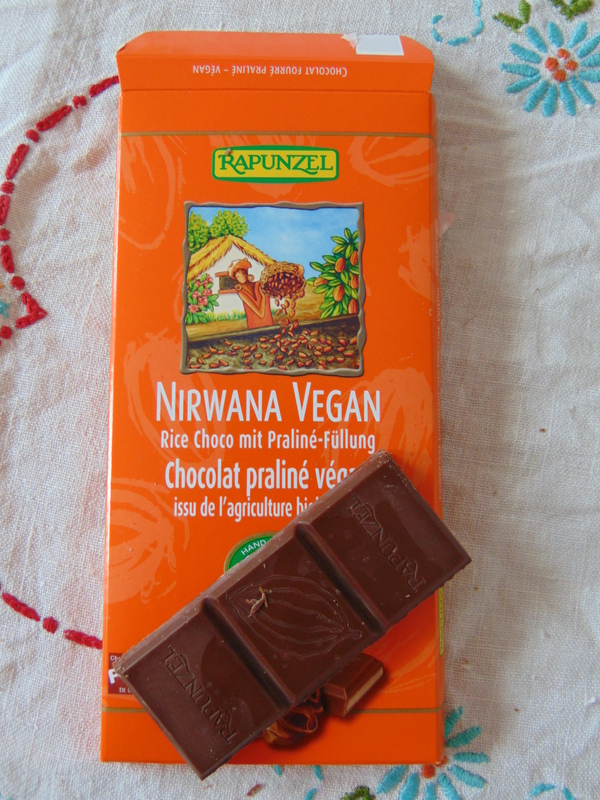 I still remember the gloomy days when I didn’t know about vegan milk chocolate and subsisted on dark chocolate -it’s nice to be enlightened at last! This one is really nice, and a much more affordable every-day alternative to the Solkiki one above (though not quite as good). I’ve had a few iChoc bars in the past, but this flavour was new to me. Like their other flavours, it was very good. 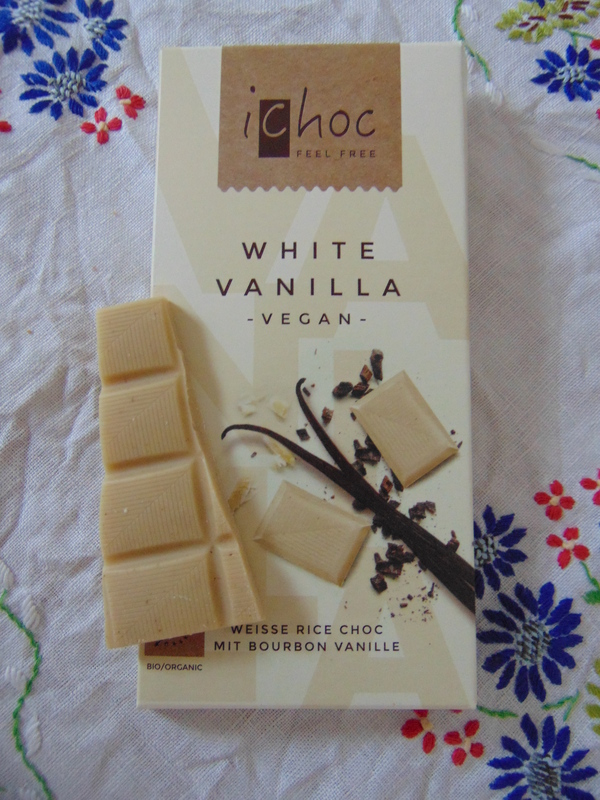 White chocolate is always a bit weird (dairy or otherwise), and I only really enjoy it when I’m the mood, but this one is very good, thanks to that twist of vanilla. I’m thinking of using the rest of this bar in baking, which is my preferred way to eat white chocolate. 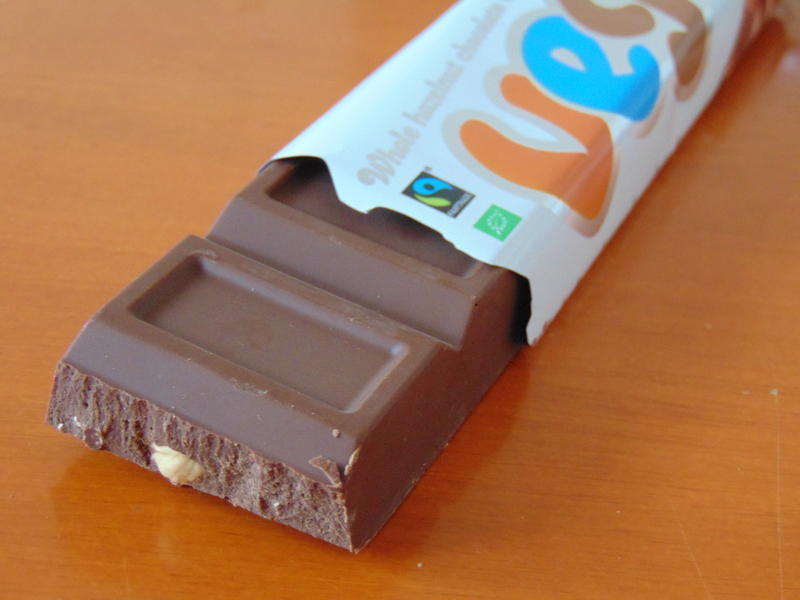 Vego is perhaps the most beloved chocolate bar in the vegan community. It’s very reminiscent of Cadbury’s Whole Nut, which I used to enjoy. The chunks are absolutely gigantic, which means you can sound virtuous by saying “I’ll only have one square”, but as the ‘square’ is the size of a small child you can still be a total glutton. What chocolate have you tucked into this Easter? Are there any incredible vegan, FEP-approved bars I’m missing out on? This entry was posted in General and tagged Food Empowerment Project, iChoc vegan, MiniMoFo, Rapunzel chocolate, Solkiki chocolate, vegan chocolate, vegan Easter, Vego chocolate. Bookmark the permalink. I find dark chocolate too bitter to really enjoy, so these are definitely better options! This is absolutely my kind of seasonal food! I don’t buy Vego very often, because I can demolish a large bar in a day. And I’m good with that! I need to get my hands on some Soliki too! 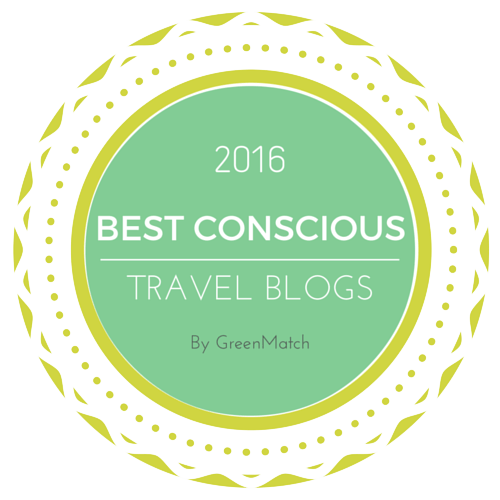 I was quite disappointed when I found out about the smaller Vego bars – I like it when I have to eat the full bar in one day (to prevent it going off, of course). Chocolate is definitely in season; they all sound great! I got some Sjaak’s melk chocolate caramel eggs — so good! Oooh, they sound lovely! I’ve seen a few caramel-filled eggs and Creme Eggs online, but nothing like that in Prague, more’s the pity. Maybe I’ll splash out on some expensive shipping next Easter! Those are some of my favourite chocolate bars too! I love Vego, iChoc and that Nirwana bar (although I think their Noir bar is better). I’ll keep an eye out for the Solkiki bars for sure given that we clearly have the same chocolate tastes. Oooh, I’ll look out for the Nirwana Noir!